Frederick Lawrence talks about how the issue is playing out on college campuses around the country, and what schools and students should do about controversial speakers. Colleges and universities around the country are struggling to find the right balance between free speech, academic freedom and campus safety. 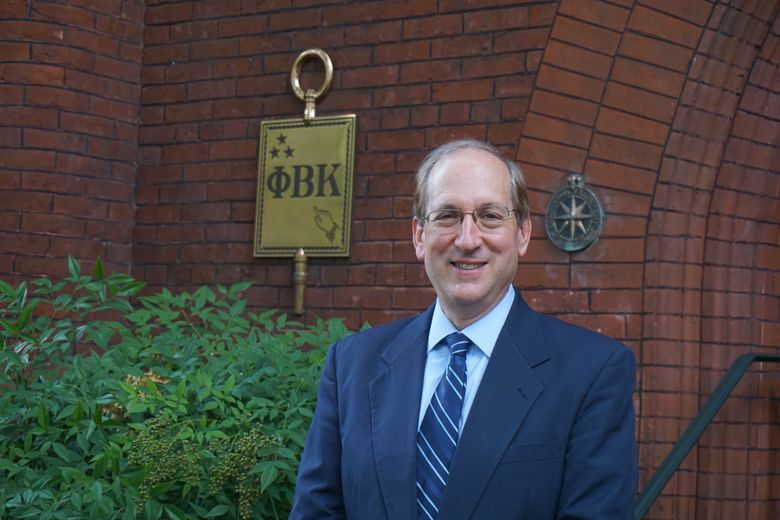 One of the nation’s experts in the field is Frederick Lawrence, a visiting professor of law at Georgetown University Law Center and secretary and CEO of The Phi Beta Kappa Society. Lawrence, former president of Brandeis University, has studied free speech for much of his career. While in Seattle this week to give a guest lecture at the University of Washington, he spoke to Education Lab about free expression on campus. Q: If the UW learned tomorrow that Richard Spencer was coming to campus, what advice would you give the administration? A: The first question I’d ask is, has he been invited by a recognized student group or a member of the UW community? If the answer is no, then you have every right to tell him you are a limited open forum, and you have no obligation to make yourself open to anybody who just wants to come to campus. But if somebody from the community or a recognized student group has invited him … I think there are a number of things you do. You make clear that the ground rules are that he has to be willing to answer questions — you might even want to see to it that there are enough people in the audience who will ask serious questions. If it’s Richard Spencer in particular, who has a very clear track record of a kind of white supremacy which is certainly inconsistent with the values of the UW as I understand them, it would be appropriate for the president or some other high-ranking official to articulate that although he is free to speak on campus, much of what he says is antithetical to the highest values of the UW. Third, some attention should be given to parallel competing events — anything from some symposium more consistent with the values of the university, to the approach at Texas A&M (which held a competing event, Aggies United, that showcased performances and speakers from a variety of groups). Recently at the University of Florida, a local pub put out an announcement that if anybody bought two tickets (to Spencer’s speech) and did not use them, they could turn them in for free drinks at the pub. That was a clever response. And finally, pay much more attention to security … If somebody’s appearance is going to create costs that are wildly disproportionate to what an event of that size normally would be, it’s not unfair to talk about how those costs should be shared. Q: And what advice would you give to students? A: With the students, I’d add the following: People like Spencer and (Milo) Yiannopoulos are wrong about almost everything. The one major thing about which they’re right is the right to speak. So why would you frame the question about the one thing they’re right about? Try to frame the question about the 27 things they’re wrong about. Of course you want to strike out — and that’s exactly the response they (the speakers) are trying to elicit …(students should) not get baited into giving an ironic kind of victory to these guys who would love to say nothing more than that the students are denying them the right to speak. Q: Are the conditions of free speech changing because of social media? I’ve seem some students viciously attacked online for their views. A: So let’s start with the easy piece. We’ve been talking about a presumption in favor of free speech. Speech that is intended to instill fear, or threats — true threats — are not protected under the First Amendment (but) social media has blurred the lines of what it means to be in somebody’s face. This is one that requires continued vigilance and attention … You can imagine this becomes more complicated in terms of what counts as a threat. It does have to be an identifiable threat designed to instill fear. Q: Are college presidents rethinking how to respond to these issues? A: It’s very important now for us to be thinking in terms of establishing first principles, because the one thing that is clearly true — from the moment one of these events or rallies is happening — is that the world starts to spin very fast. There are people who are calling the president and writing the president who are longtime supporters of the university — and people who could not find it on a map. Two days ago I was in San Diego, at the American Association of State Colleges and Universities, and spoke to several hundred college presidents and chancellors. The questions were very pointed and very specific, and people were clearly focused and clearly engaged. Last January, I spoke (about these issues) to the Association of American Colleges & Universities. My point is, this is one of the topics on the agenda. People are focused, people care; I think they are concerned that this is at the intersection of a number of very important values that don’t necessarily fit together. Free expression and free speech on campus is a deeply significant value. So is the dignity of our students, and the safety of our students. And all of these things have to be balanced. And (because of social media) you no longer get to make these decisions within the small world of your campus — you do feel like the whole world is watching. Which it is. What it leaves behind lasts for a long time. The students I spoke to yesterday (at the UW) — that Yiannopoulos rally and shooting (on Jan. 20) could have happened last week. You could see it in their eyes. This was not an abstract matter, this was seared into their conscience. How could it not be? Q: Do you see an end to this? A: I’ll give you a reason to be optimistic, and a reason to be pessimistic. At some point, this does kind of play itself out. The circus comes to town, and nobody wants to see it anymore. What’s really interesting about these guys is how uninteresting they are. If you take away all of the hoopla and you listen to what they say, a lot of it is vulgar. It’s unthoughtful, it’s unnuanced and it’s uninteresting. I hope at some point it wears off when the surrounding excitement goes away. The reason to be pessimistic? This is not an isolated phenomenon that’s totally separate from the rest of society. We’re living in an extraordinarily polarized time and this is part of that. There’s a lot of free-floating anger generally; the politics of the time exacerbates that. Campuses reflect everything going on in society, only more so. That’s the side of the argument that says this thing has a ways to go.